Little Gransden's Air & Car Show has continued to grow in popularity over the past few years due to the variety of aircraft (and vehicles)the event atrracts, its unique layout and it falling on the Summer Bank Holiday weekend. Last year's show was a sellout due to a lineup that included the Lancaster Pair, the Vulcan and Elly Sallingboe's B-17 Flying Fortress 'Sally B'. This allowed the show to donate over £75,000 to charity - with £63,743.69 going to Children in Need. 2015's show had a lot to live up to! 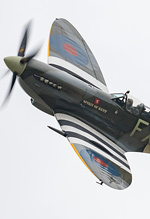 Keith Meachem braved the Bank Holiday weather to report from Little Gransden Air & Car Show for UK Airshow Review. With the Vulcan scheduled to make its final appearance at the show, the organisers found themselves close to a sellout. Before the gates opened at 10:00, long queues formed in both car parks. Once open, the crowd line filled quickly and as the morning progressed, the crowd area behind filled rapidly. By the time the display commenced at 13:00, the crowd areas seemed as full as the year before. In the run-up to the Bank Holiday weekend the forecast was not looking favourable. Early on, the sun was trying to break through the clouds and it looked as if the forecast may have been wrong. The first indication that the weather was to play a part in this year's show was the reduction in the number of visiting aircraft parked up next to the main runway compared to previous years. By the end of the show the weather forecasters were proven right - with a low cloud base, rain and falling temperatures gracing the event. The show opened with Peter Davies in his Rotorsport Calidus autogyro. 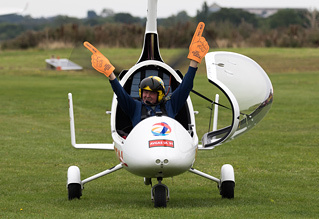 Little Gransden is an ideal venue for Peter as it allowed him to get especially close to the crowd, making excellent use of the display line to show off both his autogyro and also his day-glo hands. 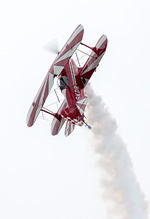 One of last year's stand out displays was Lauren Richardson in her Pitts S-1S Special. 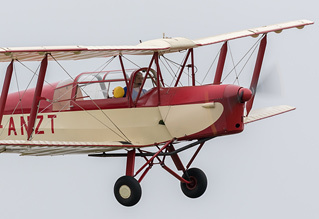 12 months on and Lauren put on another brilliant, dynamic display as she threw her Pitts Special around the Cambridgeshire skies in less than ideal conditions. Another aerobatic display that stood out was the Twister Aerobatics Team in their Silence SA1100 Twisters. The strip lighting usually reserved for the twilight displays helped both Twisters to stand out in the poor light. Dennis Neville's Flying Circus were on hand with four aircraft to entertain the crowds with their normal mixture of barnstorming fun and games. This year's display included a game of cricket and streamer cutting. The limbo part of the routine didn't go entirely to plan as the Queen Bee managed to collect the bunting between the poles. 2015's show took place only a week after the tragic events at Shoreham. As part of the Service of Remembrance, the minutes silence was dedicated to the 11 victims of the accident along with those who had lost their lives in previous conflicts. As the weather continued to deteriorate, David Poile broke the news to the crowd that the Vulcan would not be able to make its flypast due to the weather. It turned out that XH558 had returned to Robin Hood shortly after departure due to a weather front to the south - therefore it was unable to make any of its scheduled Sunday displays or flypasts. One of the late additions to the show was Mark Jefferies in his immaculate Yak-11 trainer. By the time the Yak-11 displayed the light had gone and it was raining. This restricted the Yak-11's display to several flat passes, giving the crowd the opportunity to see it's distinctive (and very wet) Soviet air force scheme. This years wing-walking act was provided by Ainhoa Sánchez from Spain - the aircraft of choice was the Boeing Stearman PT17 Kaydet being flown by Mike Dentith. Wing walking is banned in Ainhoa's home country, and as her display was being recorded for Spanish TV she was determined she was going to fly in what were less than favourable conditions. Mike made great use of the bend to allow Ainhoa to perform a close display to the crowds below. Mark Jefferies and the Global Stars aerobatic team followed with a series of passes along the crowd line. Due to the low cloud base, the more dynamic parts of the act were curtailed - instead the crowd were treated to some great formation flying. For the team, this was one of their appearances in the UK prior to heading off to Zhengzhou in China to display. 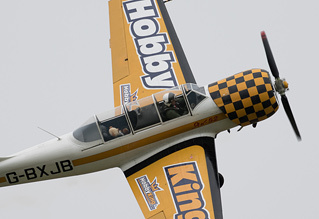 Mark closed their display with a limited solo routine in his Extra 330SC with a series of topside passes. Peter Teichman has been a long-term supporter of the show and this year brought his Curtiss P-40 Kittyhawk along. Despite the conditions, Peter put on a great display of airmanship, giving the crowd plenty of opportunities to the catch the distinctive white skulls painted on both sides of the engine cowlings. Despite the show's growth in popularity, it's lost none of it's intimate, friendly charm. David Poile and his team put on another great show - managing to keep the event on track despite the worst the weather could throw at them. Special credit has to go to the pilots and crews that displayed in what became increasingly difficult flying conditions as the afternoon progressed. Considering the forecast it was great to see the show so well attended. The crowd only started to thin once the Vulcan's cancellation was announced and the weather closed in further. Here's hoping for a sunny Little Gransden Air & Car show in 2016.